Deposed Libyan leader Moammar Gadhafi was killed Thursday, with interim Libyan Prime Minister Mahmoud Jibril saying Gadhafi was shot in crossfire between transitional government troops who captured him and the ex-ruler's loyalists. Gadhafi's death happened apparently after he survived a NATO airstrike on a convoy in the area, a senior NATO official told CNN. A different source - a spokesman for a member of the Tripoli military council - says that one of Gadhafi's sons, Mutassim, and Moammar Gadhafi's chief of intelligence, Abdullah al-Senussi, also have been killed. Early reports on how Moammar Gadhafi died were conflicting; Jibril gave his government's account late Thursday. A video aired by Al Jazeera Arabic shows someone who appears to be Gadhafi wounded - but still alive - and surrounded by fighters. A different, grisly video that aired on Al Jazeera appears to show a lifeless Gadhafi (see above). A photograph distributed by the news agency Agence France-Presse also appeared to show the longtime dictator severely wounded. CNN could not independently verify the authenticity of the images. In another major development, revolutionary fighters said they wrested control of Sirte on Thursday. And NATO said it is going to convene soon for a meeting to discuss ending its operation in Libya, a source told CNN. Moammar Gadhafi, 69, was in power for 42 years before being ousted in an uprising this year. [Update 6:16 p.m. ET] An already-injured Moammar Gadhafi was killed in a crossfire Thursday between transitional government troops and the ex-ruler's loyalists shortly after he was captured alive, National Transitional Council Prime Minister Mahmoud Jibril said late Thursday. Citing the coroner's office in Misrata, where Gadhafi's body was brought, Jibril said the fugitive former strongman had been taken alive, unharmed and without resistance in his hometown of Sirte. But a gun battle erupted between NTC fighters and Gadhafi's supporters as his captors attempted to load him into a vehicle, Jibril said, leaving Gadhafi with a wound to his right arm. More shooting erupted as the vehicle drove away, and Gadhafi was shot in the head, Jibril told reporters. Gadhafi died moments before arriving at a hospital, he said. Jibril said that before the run to the hospital, Gadhafi was found hiding in a sewage pipe, according to Reuters. Earlier, a senior NATO official said Gadhafi is believed to have been killed at the hands of fighters outside of his hometown of Sirte, Libya, after surviving a NATO airstrike on a convoy in the area. The British Broadcasting Corp. says it has talked to anti-Gadhafi forces who say they found Gadhafi hiding in a drainage pipe under a road on the outskirts of Sirte, though they were arguing over which person captured him. They also showed off a golden gun that they said was taken from Gadhafi. 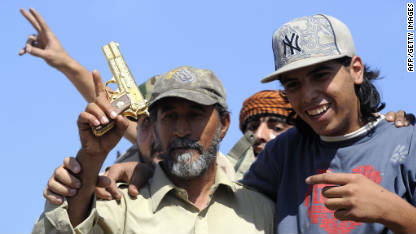 Anti-Gadhafi fighters show off an apparently gold-plated gun that they say was taken from Moammar Gadhafi on Thursday. [Update 4:06 p.m. ET] Moammar Gadhafi is believed to have survived a combined strike Thursday on his convoy near Sirte before dying later at the hands of fighters outside the coastal city, a senior NATO official told CNN. An official with the U.S. Department of Defense told CNN that French fighter jets and a Predator drone, firing a Hellfire missile, struck the convoy Thursday morning. That official, however, was unable to say if Gadhafi was part of the targeted convoy. [Update 2:59 p.m. ET] NATO Secretary-General Anders Fogh Rasmussen announced on Thursday - hours after Moammar Gadhafi was killed - that the alliance eventually "will terminate our mission" in that North African nation. "We will terminate our mission in coordination with the United Nations and the National Transitional Council. With the reported fall of Bani Walid and Sirte, that moment has now moved much closer," Rasmussen said. "Today, the government of Libya announced the death of Moammar Gadhafi. This marks the end of a long and painful chapter for the people of Libya, who now have the opportunity to determine their own destiny and a new and democratic Libya. For four decades, the Gadhafi regime ruled the Libyan people with an iron fist. Basic human rights were denied, innocent civilians were detained, beaten and killed, Libya’s wealth was squandered. The enormous potential of the Libyan people was held back, and terror was used as a political weapon. Today we can definitively say that the Gadhafi regime has come to an end. The last major regime strongholds have fallen. A new government is consolidating control over the country. One of the world’s longest serving dictators is no more. "One year ago, the notion of a free Libya seemed impossible, but then the Libyan people rose up and demanded their rights. And when Gadhafi and his forces started going city to city, town by town to brutalize men, women and children, the world refused to stand idly by. Faced with the potential of mass atrocities and a call for help from the Libyan people, the United States and our friends and allies, stopped Gadhafi’s forces in their tracks. A coalition that included the United States, NATO and Arab nations persevered through the summer to protect Libyan civilians. Meanwhile, the courageous Libyan people fought for their own future and broke the back of the regime. "This is a momentous day in the history of Libya. The dark shadow of tyranny has been lifted, and with this enormous promise, the Libyan people now have a great responsibility: to build an inclusive, tolerant and democratic Libya that stands as the ultimate rebuke to Gadhafi’s dictatorship. We look forward to the announcement of the country’s liberation, a quick formation of an interim government, and a stable transition to Libya’s first free and fair election. And we call on our Libyan friends to continue to work with the international community to secure dangerous materials and to respect the rights of all Libyans, including those who’ve been detained. "We are under no illusions. Libya will travel a long and winding road to full democracy. There will be difficult days ahead. But the United States, together with the international community, is committed to the Libyan people. You have won your revolution. Now we will be a partner as you forge a future that provides dignity, freedom and opportunity. For the region, today’s events prove once more that the rule of an iron fist inevitably comes to an end. Across the Arab world, citizens have stood up to claim their rights. Youth are delivering a powerful rebuke to dictatorship. And those leaders who try to deny their human dignity will not succeed." [Update 2:15 p.m. ET] U.S. President Barack Obama said Gadhafi's death "marks the end of a long and painful chapter for the people of Libya." The people Libya of, he said, now have the opportunity to "determine their own destiny" and form "a new and democratic Libya." "Today we can definitively say that the Gadhafi regime has come to an end," he said. Obama said the NATO mission in Libya - the United States has participated in NATO's enforcement over a no-fly zone over Libya since the early days of that country's uprising this year - will end soon. "Without putting a single U.S. (service member) on the ground, we achieved our objective, and the NATO mission will soon come to an end," Obama said. Citing what he called a growing U.S. strength around the world, Obama said: "We've demonstrated what collective action can achieve in the 21st century." [Update 1:50 p.m. ET] Arabic language TV network Al Arabiya has shown an image of what is reported to be the body of one of Gadhafi's sons, Mutassim Gadhafi. CNN has not verified the image. A spokesman for a member of the Tripoli military council said earlier Thursday that Mutassim Gadhafi and Abdullah al-Senussi - who was Moammar Gadhafi's chief of intelligence - were killed, in addition to Moammar Gadhafi. Mutassim Gadhafi once allegedly helped plot a coup against his father and had to flee the country when it failed. He was eventually forgiven and became his father's national security adviser. Mutassim was involved in official talks with Secretary of State Hillary Clinton in 2009 about improving U.S.-Libyan relations. [Update 1:49 p.m. ET] More from CNN's interview with Ali Aujali, the Libyan National Transitional Council's ambassador to the United States: He said Libya likely won't send the only man convicted in the 1988 PanAm Flight 103 bombing back to Scotland or other countries. Aujali said that maybe Abdelbeset al Megrahi can help the new government understand how the bombing over Lockerbie, Scotland, was carried out during the late Moammar Gadhafi's reign. But he cited al Megrahi's poor health as a factor, saying he is a "very sick man" and is "living with oxygen beside his bed." A Scottish court convicted al Megrahi of murder in the 1988 bombing of PanAm Flight 103, which fell from the sky after the explosion, killing 259 people on the airplane and 11 people on the ground. The Scottish government granted al Megrahi a compassionate release in 2009 for medical reasons. He was said to have had only months to live when he was released two years ago, but he still is alive. [Update 1:44 p.m. ET] Journalist Robin Wright, who has written extensively about Libya and the region, said on CNN that all of Libya's approximately 140 tribes will likely want a share of the political and economic spoils of Gadhafi’s death. [Update 1:21 p.m. ET] The Libyan National Transitional Council's ambassador to the United States, Ali Aujali, thanked President Barack Obama and the American people for their help in toppling the Moammar Gadhafi regime. "Thank you very much America," Aujali told CNNs' Wolf Blitzer. "You took the right decision." He said that the NTC will likely, in accordance with Muslim traditions, bury Gadhafi's body.Blitzer asked him where that body might be buried, but Aujali did not say, adding only that it would be done in a "humble" manner. Aujali formerly served as Libya's ambassador to the United States under Gadhafi. Blitzer asked Aujali if Libya would reimburse the United States for its operations in Libya. The United States has been part of a NATO military mission enforcing a no-fly zone over Libya since the early days of 2011's Libyan revolt against Gadhafi. "I think this is one of the issues that can be discussed," Aujali answered. [Update 1:10 p.m. ET] Another one of Moammar Gadhafi's sons, Saif al-Islam Gadhafi, has been killed, TV network Al Arabiya reports. CNN has not confirmed the report. Earlier Thursday, a member of the Tripoli military council said that Gadhafi son Mutassim Gadhafi, and Moammar Gadhafi's chief of intelligence, Abdullah al-Senussi, were killed. [Update 1:08 p.m. ET] Reacting to the news of Moammar Gadhafi's death, Vice President Joe Biden said that "NATO got it right" and "the people of Libya got rid of a dictator." Speaking to an audience in Plymouth, New Hampshire, Biden said Libya has “a chance now." He told the audience that America spent $2 billion and “didn’t lose a single life” helping to liberate Libya. “This is more a prescription about how we ought to deal going forward,” he said. [Update 12:57 p.m. ET] U.S. President Barack Obama will make a statement in the White House Rose Garden at 2 p.m. ET on Thursday, the White House announced. U.S. Sen. Mitch McConnell, the Senate minority leader, said Moammar Gadhafi's death "clears the way for the Transitional National Council in Libya to begin to put together a representative government." "A number of the people who led the Transitional National Council were educated in the United States and we are obviously hopeful that, that they will want to have a representative government and they will be an ally of the United States," said McConnell, a Republican from Kentucky. [Update 12:53 p.m. ET] Retired U.S. Army Brig. Gen. Mark T. Kimmitt told CNN that NATO probably will review what it did right, and what it could do better, in light of Gadhafi’s death. Kimmitt, who served as assistant secretary of state in the last five months of George W. Bush’s presidency, said that among some of the questions NATO should answer is how to locate shoulder-fire missiles which are reportedly aplenty in the country, as well as mines which are unaccounted for, he said. [Update 12:37 p.m. ET] TV networks Al Jazeera Arabic and Al Rabiya are showing video of someone who appears to be Moamaar Gadhafi wounded - but still alive - and surrounded by fighters. Video that Al Jazeera aired earlier today shows what appears to be Gadhafi's lifeless body. 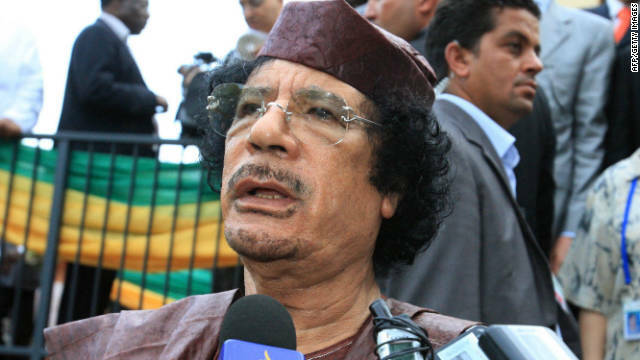 Conflicting reports have been made regarding how Gadhafi died on Thursday. Libyan Information Minister Mahmoud Shammam told CNN that revolutionary fighters attacked a house where Gadhafi was hiding, and that Gadhafi was shot while trying to flee. Guma el-Gamaty, a Libyan political activist and former London coordinator for Libya's National Transitional Council, told CNN from London that Gadhafi was conscious and was talking shortly after he was injured. El-Gamaty, citing leaders of anti-Gadhafi forces, also said that Gadhafi was injured as he resisted attempts to capture him. Gadhafi said, “who are you, what’s going on?” after he was injured, but died later, according to el-Gamaty, who cited anti-Gadhafi forces. El-Gamaty said Gadhafi died as he was being transported to a hospital in Misrata. [Update 12:20 p.m. ET] German Chancellor Angela Merkel said the death of Moammar Gadhafi on Thursday is "important" for Libyans. "A bloody war which Gadhafi waged against his own people now comes to a close. The way is finally clear for a new and peaceful political beginning," she said. [Update 12:17 p.m. ET] French President Nicolas Sarkozy's office called Moammar Gadhafi's "disappearance" Thursday a "major step" in the struggle by Libyans to "free themselves from dictatorship and violence." [Update 11:50 a.m. ET] David Gergen, a CNN senior political analyst and an adviser to four U.S. presidents, reacted to Gadhafi’s death: “Thank goodness. The world is rid of a tyrant,” he told CNN’s Wolf Blitzer. Gadhafi's death “does promise something new” for Libya, and the Libyans “deserve” this news, Gergen said. However, Gergen cautioned that the death doesn’t bring stability to Libya or the region. [Update 11:46 a.m. ET] Moammar Gadhafi "was not killed in an airstrike," interim Libyan Prime Minister Mahmoud Jibril said Thursday in Tripoli. Conflicting reports have been made regarding how and where Gadhafi died. Libyan Information Minister Mahmoud Shammam told CNN that revolutionary fighters attacked a house where Gadhafi was hiding, and that Gadhafi was shot while trying to flee. NATO has said that its aircraft struck two pro-Gadhafi military vehicles in the vicinity of Sirte. It's unclear whether that had any role in Gadhafi's death. [Update 11:45 a.m. ET] U.S. Sen. John McCain said of reports of Gadhafi's death: "I think it's a great day." The United States has been part of a NATO military mission enforcing a no-fly zone over Libya since the early days of 2011's Libyan revolt against Gadhafi. McCain said that when he and other lawmakers visited Tripoli to speak with anti-Gadhafi officials after Gadhafi's overthrow, those officials said that they would seriously consider reimbursing the United States for its efforts. The amount that the Libyans said they would try to give back to the United States is approximately $1 billion, McCain told CNN's Wolf Blitzer. U.S. Defense Department costs for operations in Libya stand at about $1.1 billion as of September 30, according to Pentagon spokesman George Little. That includes daily military operations, munitions, the drawdown of supplies and humanitarian assistance. McCain said that the administration of U.S. President Barack Obama "deserves credit" for how the crisis in Libya has been handled. [Update 11:35 a.m. ET] U.N. Secretary-General Ban Ki-moon said Gadhafi's death "marks a historic transition for Libya." "In the coming days, we will witness scenes of celebration, as well as grief for those who lost so much. Yet let us recognize, immediately, that this is only the end of the beginning," Ban said, referring in part to the work that Libya's anti-Gadhafi movement still has to do to transition from Gadhafi's regime. "The road ahead for Libya and its people will be difficult and full of challenges.". [Update 11:27 a.m. ET] Streets in Libya's capital, Tripoli, are jammed with people who are celebrating, CNN's Dan Rivers reports from the city. Gunfire - presumably celebratory - can be heard. Video from Tripoli shows many people waving the flag that Libya's National Transitional Council adopted after Gadhafi's ouster. [Update 11:21 a.m. ET] A pro-Moammar Gadhafi channel, Al-Rai, is now reporting the death of the former Libyan leader, citing NATO sources. [Update 11:02 a.m. ET] The Libyan ambassador to the United Kingdom confirmed Moammar Gadhafi's death Thursday and said his body is in the Libyan city of Misrata. News of the ambassador's comments comes minutes after the interim Libyan prime minister announced Gadhafi's death. [Update 10:59 a.m. ET] The son of a long-missing anti-Gadhafi activist says that reports of Gadhafi’s death are overwhelming to him. Almegaryaf is the son of Izzat Almegaryaf, who the son says was captured by Egyptian security services in 1990 and handed over to the Libyans. He said he has not heard from his father since. Almegaryaf said he that even if his father is dead, Izzat Almegaryaf will be “smiling down” on Libya if Gadhafi is gone. Read more about Almegaryaf. [Update 10:54 a.m. ET] NATO's top military official, Supreme Allied Commander Adm. James Stavridis, will call for a special session to address ending the NATO mission in Libya, a senior NATO official says, according to CNN's Barbara Starr. “It will be very soon, perhaps next day or two. (Stavridis) will give a recommendation and a special session of the NAC will be convened," the official said. Stavridis is now looking at “key pieces of intelligence” to make that recommendation, according to the official. That will include assessing whether anti-Gadhafi forces control Sirte, and whether Gadhafi loyalists can mount any significant counter-strike. [Update 10:39 a.m. ET] Gadhafi's son, Mutassim, and his chief of intelligence, Abdullah al-Senussi, have been killed, according to Anees al-Sharif, spokesman for AbdelHakim Belhajj of the Tripoli military council. This report comes on the day that the interim Libyan prime minister says that Moammar Gadhafi was killed. [Update 10:36 a.m. ET] Former Libyan leader Moammar Gadhafi has been killed, interim Libyan Prime Minister Mahmoud Jibril told reporters in Tripoli Thursday. [Update 10:32 a.m. ET] Catherine Ashton, the European Union foreign policy chief, said if the reports of Gadhafi's death are confirmed, his demise "brings closure to a tragic period in the lives of so many Libyans." She also said that the fall of Gadhafi's hometown of Sirte "marks the end of the Gadhafi era." "Libya is now under the full control of National Transitional Council forces," she said. [Update 10:22 a.m. ET] Guma el-Gamaty, a Libyan political activist and former London coordinator for Libya's National Transitional Council, told CNN from London that leaders of anti-Gadhafi forces told him that Gadhafi was conscious and was talking shortly after he was injured. Gadhafi said, “who are you, what’s going on?” but died later, according to el-Gamaty, who cited anti-Gadhafi forces. He said Gadhafi was injured as he resisted attempts to capture him. [Update 10:14 a.m. ET] CNN's Ben Wedeman, who has covered the uprising in Libya for months, said one of the biggest risks for Libya moving forward is a strong impulse among revolutionary fighters and political leaders to commit revenge killings in an attempt to get rid of leftover elements of Gadhafi’s regime. Rioting and looting, thanks to overall instability, could follow, Wedeman said. Former Gadhafi aide Abubaker Saad, now a professor of Middle Eastern history at Western Connecticut State University, told CNN that he is more optimistic about how Gadhafi's alleged death would affect Libya. He said on CNN that Libya's National Transitional Council is "really thirsty" to enact democratic reforms in the country.Saad said positive change will happen, but he added that it would be "foolish" to expect "smooth sailing" in a country which has been ruled for more than four decades by a dictator. [Update 10:07 a.m. ET] Cell phone video aired by Arabic language TV network Al Jazeera appears to show Gadhafi's bloody body. [Update 10 a.m. ET] CNN's Phil Black, reporting from the British prime minister's residence in London, says that the British government is making no comment about reports of Gadhafi's death, and that it's unlikely they would do so before Washington. Black noted that there have been "enthusiastic" reports of other Libyan leaders' deaths and capture since the fall of Tripoli that have turned out to be false. [Update 9:56 a.m. ET] A State Department official familiar with the latest information coming out of Libya said it “looks like he’s been killed," but the department is still awaiting official confirmation. The official would only speak if his name not be used. [Update 9:29 a.m. ET] Secretary of State Hillary Clinton can't confirm reports of Moammar Gadhafi's capture or death. But she said on Thursday either development would "add legitimacy and relief to the formation of a new government" in Libya. A former member of the Libyan National Transitional Council, Guma El-Gamaty, told CNN from London that Gadhafi is dead. "This is the end of the tyrant," he said. [Update 9:21 a.m. ET] Rebels said Moammar Gadhafi was killed when fighters attacked the house where he was Thursday, National Transitional Council Information Minister Mahmoud Shamman told CNN. "He tried to flee and they killed him. When they met him, he was alive and he was killed in action," Shamman said. Shamman said the NTC's chairman or prime minister will officially confirm the death. Abubaker Saad, who worked for Gadhafi for nine years, spoke to CNN via Skype. He viewed a photo that news agency AFP says is Gadhafi bloodied and captured. Saad said he is "90 percent" sure that the man in the photo is Gadhafi. Saad said he is "thrilled" at the news and that it was crucial to have Gadhafi captured or killed - either one - because as long as he was alive or free, he could possibly rally supporters and maintain some level of power. Saad is a professor in the history department at Western Connecticut State University. He teaches Middle East history and cultures. [Update 9:04 a.m. ET] Most Western governments declined to comment on the reports Thursday, with the U.S. State Department saying it could not confirm the media reports were correct. One exception was Dutch Prime Minister Mark Rutte, whose country took part in the NATO-led air operation in Libya, who said Gadhafi was in custody. "My assistant has just told me that Gadhafi really has been captured," Rutte said during a visit to Moscow. "I am glad that he has been captured." Listen to why Washington is hesitating to confirm reports. If reports are true, it is positive news for U.S. national security, CNN's Barbara Starr reports. [Update 8:56 a.m. ET] Mahmoud Shamman, National Transitional Council Information Minister, tells CNN that a press conference will be happening soon about the alleged death of Gadhafi. Shamman said Gadhafi is dead and that is "a great victory" for the Libyan people. CNN's Dan Rivers spoke to him in Tripoli where crowds are cheering, shooting guns in a celebratory way and honking their horns. Rebels said Gadhafi was killed when fighters attacked the house where he was Thursday, Shamman told CNN. "He tried to flee and they killed him. When they met him, he was alive and he was killed in action," Shamman said. Shamman said the NTC's chairman or prime minister will officially confirm the death. CNN's Ben Wedeman, who covers the region and has covered Libya extensively, said that much caution should be used with these reports, because false information has come out previously. It is being reported that Gadhafi was found in a storm drain. "It's a bit of surprise because we knew that he had escaped from Tripoli" with a lot of cash and weapons, Wedeman said. It would seem odd that Gadhafi would end up in a manhole-type of area, Wedeman said live on CNN. [Update 8:47 a.m. ET] A cell phone photo, seen above, distributed by the Agence France-Presse shows the apparent arrest of former Libyan leader Moammar Gadhafi. In the photo, a man identified as Gadhafi appears wounded and bloodied. [Update 8:39 a.m. ET] AbdelHakim Bilhajj, head of the National Transitional Council military arm in Tripoli, announced live on Al-Jazeera Arabic Thursday that Gadhafi is dead. Al-Ahrar, a National Transitional Council TV station, reports that Gadhafi is dead. The station didn't cite a source and the news couldn't be independently confirmed. The White House has not confirmed the report of Gadhafi's death or capture, a senior administration official said Thursday. NATO said its aircraft struck two pro-Gadhafi military vehicles in the Sirte vicinity Thursday. "These armed vehicles were conducting military operations and presented a clear threat to civilians," Col. Roland Lavoie said. Earlier Thursday morning CNN reported that revolutionary fighters said they had captured Gadhafi. That was reported on Libyan television on Thursday. The report cited the Misrata Military Council. That report could not be independently confirmed by CNN. Around that time, the National Transitional Council military spokesman told CNN that reports of Gadhafi's capture are only rumors. Abdurahman Bousin added at that time that it was doubtful that Gadhafi was even in or around his hometown of Sirte. Meanwhile fighters loyal to the NTC took control of Sirte Thursday, the council said. CNN's Dan Rivers is in Tripoli where massive crowds are cheering and honking their car horns. Many are shooting into the air in celebration. [Update 8:07 a.m. ET] The State Department can't confirm reports about the capture or killing of Gadhafi, a spokeswoman said Thursday. [Update 7:32 a.m. ET] A "big fish" has been captured in Libya, but a spokesman for the new rulers couldn't say for sure whether it was Gadhafi.